Biblical history is the record of God’s dealings with man and man’s search for God. Jesus’ Jewish audience had history with God. They prided themselves that they were God’s chosen people. They boasted in their rich heritage of kings like David and Solomon, and prophets such as Jonah and Daniel. Under the daily weight of Roman occupation the Jews’ spiritual heritage was a matter of intense national and personal importance, a constant reminder of their unique status among the nations despite their Roman political overlords. Into this unpredictable and volatile atmosphere Jesus throws a serious challenge. He tells them there is something before them right now that is even greater than their history, greater than their heroes like Solomon and Jonah, and yet they are close to missing it. On another occasion He tells them that the Kingdom He is bringing is mightier than even the greatest of their prophets, John the Baptist (Matt.11:11,12). “Don’t cling to your history which is passing away. The Kingdom you have been waiting for is now here among you. It is more important than your history, your prophets or your kings. Reach out with both hands and grab a firm hold of it,” He warned them (paraphrase mine). The Kingdom had come suddenly, was rapidly advancing, and those who stood passively by would not be part of it. I believe we are living in a similar hour in time. In this series of posts called Altar, Temple, Kingdom I want to explore three major seasons in history, two of which are passing away and the third increasingly among us. These three spiritual seasons are historical, but also personal in that they represent three stages of our individual spiritual journeys in Christ. We will begin with the season of the altar. In Luke 11:37-54 we find Jesus dining among Pharisees and lawyers (experts in the law of Moses). Again, Jesus gives a history lesson, graphically relating their nation’s violent rejection of the messengers God has sent throughout Jewish history. Jesus specifically mentions two people: Abel and Zechariah, both victims of murder. This is one of those occasions when Jesus is speaking about two things at once. On the one hand He details the place where Zechariah was murdered: ‘between the altar and the temple”. But within the phrase ‘between the altar and the temple’ there is also a period of history that covers the time frame between the life of Abel and the life of the prophet Zechariah. Abel, living at the very beginning of Old Testament history represents the altar; Zechariah, who lived close to the end of Old Testament history, represents the temple. Many Old Testament prophets and apostles God had sent to His people were killed between the time of Abel, representing the altar, and the time of Zechariah, representing the temple. Why did God respect Abel and his offering? This Hebrew word translated ‘respect’ means to gaze at, regard, or behold. When God looked at Abel’s offering what was He gazing at that caused Him to regard it with such respect? He was looking forward into human history and seeing the blood sacrifice of His Son. Abel brought an offering of innocent shed blood to God while Cain brought an offering without blood. God is beyond time and beyond human history. He does not have to wait for an event to come to pass in order to see or experience it. Abel bought a slain lamb to God and, in the Spirit, God saw the Lamb of God. Historically Abel personifies the initial stage of fallen humanity’s quest for re-connection to God: the season of the altar. Biblically the altar is a place of repentance and offering. Abel spiritually understood that sin had caused a great distance between God and himself that he was unable to cross without a sinless mediator to bridge the gap. With his bloodless offering Cain did not acknowledge his need for a mediator between God and himself, and therefore did not acknowledge his sinful state. Hebrews 11:4 tells us Abel’s offering was by faith. He had faith that through an innocent blood offering God had the power to make him righteous. The season of the altar therefore began with Abel and continued for many generations. The next notable person recorded in the Bible who built an altar to God is Noah (Gen. 8:20), and nearly nine hundred years later we then find Abram also building an altar to the Lord (Gen. 12:7). The altar and the offering became intrinsic to the relationship between mankind and God. For many centuries altars were erected wherever and whenever man wanted to acknowledge his need of God’s favor and mercy. There is a parallel season to this beginning stage of Old Testament history in our individual journeys into the fullness of Christ. This historical ‘season of the altar’ also represents the initial stage of salvation, the new birth – that period of time when we first come into Christ Jesus. We come via the altar of His Cross, we understand a sacrificial offering has been made for us, and by faith we are born again and reconciled to God. In our Christian lives, that season is the first part of our history under redemption. It is our season of the altar. So from Abel onwards, from one generation to the next, people related to God through the altar. For roughly 2,370 years, from Abel to Moses, the altar was the means by which humanity sought fellowship with God. Biblical history is about the progressive revelation of Christ. Everything God does is centered on His Son. The entire history of mankind is about God gradually revealing His beloved Son to us. Approximately two thousand years after Abel lived, God raised up a man named Moses and with Moses God’s people were propelled into the ‘season of the temple’. It was Moses who led the Israelites out of enslavement in Egypt, towards the land God had promised them. It was during this journey that God revealed a pattern for a physical sanctuary, a temple, where He would manifest His Presence and His people could worship Him. So God gave Moses the pattern for a tabernacle, or portable temple, because the people were on a journey and the temple had to be packed up and moved along with them. The ancient altar did not disappear but was incorporated as an essential element into the tabernacle/temple. God was propelling His people forward from the ‘season of the altar’ to the greater ‘season of the temple’. Later, after Israel had taken possession of the promised land, King David wanted to replace the tabernacle with a great building where God could dwell among His people permanently. But it was his son Solomon who fulfilled his dream and built the first great temple in Jerusalem. The temple was divided into three parts: the Outer Court where the ordinary people were allowed to gather, the Holy Place which included the altar where only priests could minister, and the Holy of Holies where only the High Priest could enter once a year as mediator between God and man. The temple was a busy place with different ranks of priests offering sacrifices, burning incense, cleaning the altar, blowing trumpets, and performing many other duties, but the ordinary Israelites were excluded from many of the proceedings. Central to the sacred atmosphere of the Temple were the stone tablets containing the Ten Commandments, representing the Law, which were kept in the ark of the covenant in the Holy of Holies (2 Chronicles 5:6-10). Temple life was about hierarchy, offerings and law keeping. Despite the presence of the temple with all its activity God’s people did not seek to truly follow Him, carrying out their temple rituals while continuing to involve themselves in every kind of idolatry. During this period God was also raising up prophets in Israel who would call the people back to God. The warnings of the prophets were often rejected and the prophets were persecuted and sometimes killed by the people and their leaders. 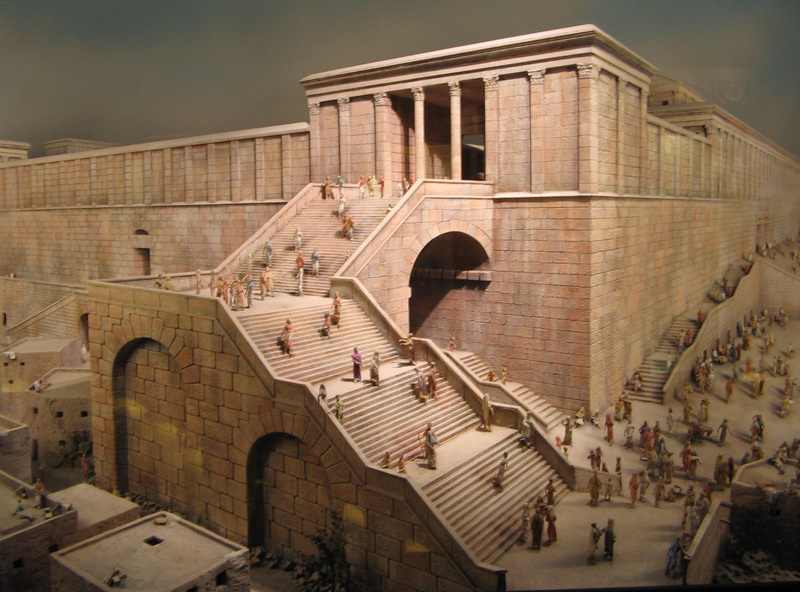 After standing for 350 years Solomon’s great temple was destroyed by the invading Babylonians and the Israelites were taken into captivity for 70 years. Now, this is where Zechariah comes in. Zechariah was a Jewish prophet living in Israel at a time when a remnant of Israelites was returning to Jerusalem from Babylonian captivity. Zechariah symbolizes for us the second stage of Biblical history, the season of the temple. He lived near its end, roughly three and a half thousand years after Abel and five hundred years before Jesus. The book of Zechariah is the second last book of the Old Testament. Though Zechariah’s focus was on the rebuilding of the temple, he prophesied also of a coming age when a King who was also a Priest would build a new temple and establish His Kingdom. “Behold, the Man whose name is the Branch! From His place He shall branch out, And He shall build the temple of the Lord; yes, He shall build the temple of the Lord. He shall bear the glory, and shall sit and rule on His throne; so He shall be a priest on His throne, and the counsel of peace shall be between them both.” Zech 6:12,13 . Just as the alter season represents the initial stage of our journey into Christ, so does the temple season represent the next stage. We come into Christ through the altar of the Cross when we are born again of the Spirit. Now, as the Spirit leads us further, we learn what it means to be part of the spiritual Body of Christ on earth. We join with other believers in a physical building to worship and fellowship together. Our Christian identity becomes closely tied to the activities of our local ‘temple’ and we often begin to look to the ‘temple’ for our spiritual, emotional and social needs. We have entered our ‘temple season’. The temple is not the final destination however. In Old Testament times the temple season was all about law keeping, hierarchy and continuous sacrifice. It was about a limited, very specific priesthood, a geographical meeting place, and works based religion. In other words, it was earth bound. Sadly, this is where many believers currently find themselves, trying to live life in the Kingdom while confined to the boundaries of the ‘temple’. But something greater is here among us. Over 4000 years of Old Testament history, from Abel to Zechariah, “between the altar and the temple”, God was progressively revealing His Son and His coming Kingdom. And then God moved the goal posts. Stay tuned for Part Two of Altar, Temple, Kingdom. I like the new look! Interesting post. I hadn’t considered Abel & Zechariah as poles of Old Testament history before. I’m also iintrigued by looking at them as stages of spiritual growth. I look forward to reading part 2! Thankyou Teague. I had not considered Abel and Zechariah as poles of Old Testament history before either, but there are things hidden in the Word that aren’t discerned by study yet unfold before us at the time the Holy Spirit chooses to reveal them. Thank God that His Word is living and active and not staid and predictable. Thankyou for your comments. ‘truly edified by your post. Thank you. Pamela, Thankyou for your kind words. May His Life continue to refresh and sustain you today and forever. “And then God moved the goal posts.” Love that! I look forward to the next installment. What a gift to live in His time of increasing brilliance. Thank you for this powerful post, Cheryl. Thankyou for dropping by with encouragement Nancy! This is the way the gift of teaching was intended. Un-religious and agenda free, expressing the pure form of Christ in all things. This is indeed a powerful post, Cheryl! You illuminate so much here. Thankyou for your comments Paul. Please pray for me that the Lord would continue to speak in power through my weakness. This is a magnificent post. Thank you. I am humbled by your comment. Thankyou.